Create a festive atmosphere and an American identity to your street front with our pole mounted flags. Everyone loves an all-American main street for friends and family to assemble get together and have a great time. The residents will love the sudden spurt of attention that these flags will grab for them while the retailers along the street will be pleased with the additional foot traffic. Our 3'x5' U.S. Flag Street Pole Mounting Kits are available in two different models with and without flag to match your flag flying needs. Shop from our complete line of Pole Mounted Flags right away and get the best prices, quick shipping and much more! Our pole mounted kits feature extra heavy wall pole and premium US nylon outdoor flag that will let you create the cheerful setting of the All-American downtown. These pole mounted poles will leave a charm to your neighborhood and makes a jovial way to celebrate American pride. 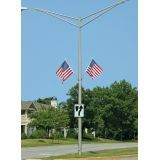 These high quality pole mounted kits that are offered both with or without flags will spread the American spirit along the streets and into the crowd. Browse our collection of Pole Mounted Flags that will make a cheerful way to decorate your neighborhood. Call us toll free at (888) 287-3524 or email us at customercare@tuffflags.com for further assistance.